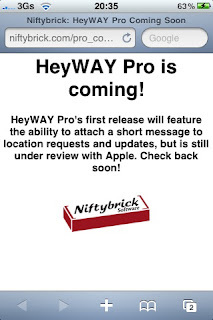 HeyWay was one of the first iPhone apps with push notifications enabled. Since then, it remained one of my favourite apps of all time, something impressive for a little free app. HeyWay is a location service that lets you keep track of where friends, family and colleagues are. Send alerts with your current location to your followers, or send "Hey, Where Are You?" alerts requesting their location. All this using Push Notifications. It´s sweet. Good news is that Niftybrick is bringing a premium version, that will add my #1 feature request: ability to add quick notes to the notifications! If the price is right, this is an instant buy for me!